With that single act all the compromises inherent in wearing ready-to-wear coats (the poor cloth, the fit across the shoulders, the short length and the fact that most simply hang straight from the arm pits to the hem, rather than having any shape through the waist) are revealed, and simultaneously dispatched. However, it can be hard to know where to start – cashmere, tweed, double-breasted, single-breasted, camel hair, Donegal or Harris tweed? 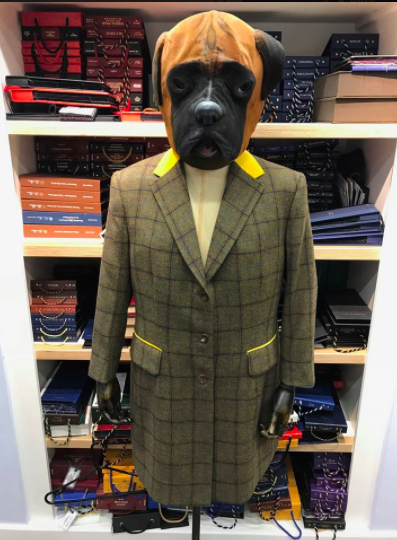 If you’re dressing for the office a single-breasted, fly-fronted chesterfield in navy blue should probably be top of the list, but in terms of versatility it’s hard to beat a covert coat. These are made from covert cloth, an olive or fawn coloured twill wool cloth, and they take a formal form, with flapped hip pockets and breast pocket, but retain some rugged appeal thanks to the rustic nature of the cloth. The name covert is a reference to the fact that this is a garment that was first worn on the hunting field, which accounts for the durability and the colour of fabric. Despite these rural origins the coat retains a crisp, urban look, with slightly old-fashioned associations to Eighties Sloane Ranger fashions. These can be avoided as long as you resist the temptation to wear your Covert coat with red cords and black loafers. Instead, for a look worthy of Terence Stamp, try it at the weekend over a thick Shetland sweater, a blue silk scarf, some textured tweed trousers and pair of heavy brown brogues. However, come Monday morning the coat will look just as sharp worn over a grey business suit.